eedeThailand's Worst Flood (18 Nov 2011) - YouTube: " "
Thailand and Asia News The News Forum. Thai News, world News and current affairs. Find out what's happening in the world today. For local Thai News check out Bangkok News, Chiang Rai News, Koh Samui News, Pattaya News and Phuket News. Nonthaburi Governor Wichien Phuttiwinyu promised a gathering of angry residents yesterday that most of them should resume life as normal by December 1. "There might be some flooding, but you should be able to return to your homes by then," he said. He was speaking after about 1,000 Nonthaburi residents gathered at the city hall to demand that he tackle the crisis right away. People in the province's Bang Bua Thong, Bang Yai, Bang Kruay and Pak Kret districts have been struggling with serious flooding for more than a month. After listening to the residents' complaints and speaking to them, Wichien promised to get at least 1,000 pumps as soon as possible to drain the flood water. Pheu Thai MP for Nonthaburi Chalong Riawraeng, who was also present at the gathering, backed Wichien's promise. The governor said: "Flood levels should drop by more than 20 centimetres." He added that Bang Bua Thong should see the results first, though Sai Noi would continue being heavily flooded beyond December 1. Wichien also said he would ask Bangkok Governor Sukhumbhand Paribatra to allow more water through the sluice gate in Mahasawas Canal as well as consider building a dam around the border between the two provinces. "You can return on Sunday to hear the conclusion," he said. Meanwhile, Chalong said that if the Bangkok Metropolitan Administration (BMA) did not respond, Nonthaburi residents could take the matter in their own hands. The residents got together yesterday after networking via Facebook. In a separate move, representatives from more than 10 neighbourhoods in Bang Bua Thong district demanded that Wichien block government efforts to dry Highway 340, which they say is making matters worse for them. The government has been trying to drain flood waters from Highway 340 to make it passable, since it can be an alternative route if Rama II Road, which links the capital to the South, gets flooded. Dissent among flood-affected residents has been rising, especially in areas where barriers have been put up. On Thursday, a flood defence along the border of Bangkok's Sai Mai district and Pathum Thani's Khukot area was blown apart with firecrackers. Sukhumbhand said representatives of the people affected by floods and the government's Flood Relief Operation Centre will meet for talks today. "I won't be present because I don't want to be seen as taking sides. I will assign BMA officials to take part in the negotiations instead," he said, adding that he disagreed with any plans to remove the sandbag barriers. He said as much as 4 million cubic metres of water would rush into Bangkok's Sai Mai district daily if the barrier were removed. "If such huge volumes of water flow in, the flooding might drag into 2012," he said. He was speaking after visiting Sai Mai residents, who asked him to stop people living in Khukot from tearing down more parts of the flood barrier. At press time, about 20 metres of the barrier had been damaged, allowing run-offs from Pathum Thani to rage into the area. However, the level of Lat Phrao Canal, which runs through Sai Mai, dropped by 2-4cm yesterday. The level of key canals in the capital's east also dropped, as did the level of several canals in the west, though huge volumes of water from Nakhon Pathom's tambon Salaya still flowed into Bangkok. "Thaksin thinks, Puea Thai acts"
Last edited by StrontiumDog : Today at 10:06 AM. Water expert Chawalit Chantararat, who is also executive director of the TEAM Group, is calling on residents living in nonflooded parts of Bangkok to help dredge waterways and unclog drains in floodravaged areas. TEAM Group is a conglomeration of environmental consultants. According to him, the level of Chao Phraya and Ta Chin rivers is going to drop significantly for four hours daily until Thursday, and that everyone should take advantage of this lowtide period to direct runoffs to these rivers. "In order to do this, we need to dredge canals and remove garbage from clogged drains first," he explained. Chawalit also recommended that relevant officials open canal sluice gates fully during the lowtide period. "In Nonthaburi's Bang Kruay district, water should be directed from Bangkok's Natee Canal to the Bangkok Noi Canal," he said. He said that if the clearing effort worked, the level of Mahasawas Canal should drop and the Borommaratchachonnanee Road should be open to traffic next week. He added that though the flooded areas will not be dried out immediately, they should provide visible results. Chawalit said people should take inspiration from the residents of Samut Sakhon's Ban Phaeo district, who got together to drain flood waters from their area. Meanwhile, a channel is being dug up along the Bang Nam Jued Canal to help ease flooding in the border shared by Bangkok and Samut Sakhon. The Bang Nam Jued Canal links the Phasi Charoen Canal and Sanam Chai Canal, which direct water into waterretention areas. Located near Rama II Road, the Bang Nam Jued Canal only has the capacity to move 4 cubic metres of water per second. The new channel, which will be about 100 metres long, will be equipped with several pumps and should be able to push 15 cubic metres of water per second. Thailand should turn the flood crisis into an opportunity by introducing a comprehensive flood and water management system, Dutch water-management expert Adri Verwey said. "The will is very important," said Verwey, who was dispatched by the Netherlands government and spent weeks in Bangkok helping the Flood Relief Operations Centre (FROC). Verwey, who is leaving Thailand this weekend as it begins to appear that inner Bangkok will be spared, said it would take Thailand years to ensure that Bangkok becomes a safe and stable environment in terms of flood risk. Verwey, who spoke at the Dutch Embassy on Thursday evening, said that a comprehensive flood and water management system in central Thailand will stimulate the economy. He believes Thailand does not need to relocate its capital, as proposed by some 20 Pheu Thai Party MPs, adding that it can learn from the Netherlands and other nations which face a similar threat. "Don't rush," Verwey said. "Bangkok can still go on for quite some time [as the capital]." Dutch Ambassador Joan Boer said he hopes the flooding will serve as a "tipping point" for Thai society in committing itself to making citizens feel safe from flooding. Boer added that his home in the Netherlands, dating from the 1780s, is two metres below sea level, but he feels completely safe. The ambassador said his government is more than willing to assist Thailand in learning from its successes as well as failures in tackling flooding over the decades. The envoy added, however, that it took 50 years of investment to build what exists in his country today. Verwey, who said industrial estates like Lat Krabang could be spared if sluice gates and flood barriers are properly maintained over the next seven days, added that Thailand may not need a new water authority as some have suggested. What is essential, however, is for the Kingdom to have a "clear rule" that governs the way various authorities talk with one another. "We try to make water [a] non-political issue in Holland." Asked if it is now safe for residents of inner Bangkok to remove their flood defences, Verwey said it was up to individuals. He added, however, that since there are so many sandbags in Bangkok and surrounding areas at the moment, the selling price would be low, while holding on to them a little longer might fetch a better price. It might be worth noting, however, that as of Thursday evening, the Dutch Embassy on Soi Ton Son Road was still protected by sandbags outside its gates. Though most of the international attention from the flooding in Southeast Asia has focused on Thailand, other countries have also suffered. In Cambodia, shown here, at least 240 flood-related deaths have been reported. Water levels may have receded significantly in parts of Bangkok after weeks of devastating flooding, and the number of affected provinces in the Thai capital is now just 20 compared with a high of 64. But as more than 5.3 million remain affected by the floodwaters, the crisis is far from over for the Thai kingdom. The death toll — now at 594, according to the Thai government — continues to rise steadily, with more than 60 deaths since last Thursday. Most of the flood-related deaths have been a result of drowning or electrocution, according to relief agencies, and there are no epidemic-related warnings to date. But this has not stopped some foreign embassies from urging their citizens to avoid traveling to the Thai capital for fear of disease outbreaks. “We continue to advise Singaporeans to consider deferring non-essential travel to Bangkok and other affected provinces,” said a statement issued Thursday from Singapore’s Ministry of Foreign Affairs, citing warnings from the Bangkok Metropolitan Authority that outbreaks of diseases like diarrhea, leptospirosis, colds and flu as well as infected wounds could be possible in flood-affected areas. The Public Health Ministry has warned that in in flooded areas, leptospirosis , a rare disease spread through animal urine that can lead to death, is possible. In a recent survey, 21 food samples in four flooded provinces including Bangkok yielded food-poisoning manifestations. Additionally, one leptospirosis case was reported in Khon Kaen, an area in northwest Thailand, with 20 suspected cases, according to relief agencies. Compounding the problem, the bacterial disease remains in flooded areas for two weeks even after the water recedes. Though the main tourist areas and business district of Bangkok continue to stay dry, fears on the part of tourists now deferring their travel — compounded with engulfed factories and agricultural land, and the more than a million Thais who have now found themselves unemployed — indicates that the economic toll of the crisis is just starting to be felt. “This is a natural disaster,” United Nations Secretary-General Ban Ki-Moon, who toured flood affected areas in a helicopter two days ago, was cited a saying in a report from the United Nations. “I have seen many areas of natural disasters, but it is beyond any imagination”. U.S. Secretary of State Hillary Clinton has announced $10 million in flood recovery assistance to Thailand, in addition to the $1.1 million in direct humanitarian aid previously given to the Thai Red Cross, the U.S. Agency for International Development and the International Organization for Migration. Relief agencies continue to work to provide necessities like rescue boats, life vests, water-treatment filters and basic hygiene kits with items like soap, chlorine drops for water purification and alcohol hand-wash gel. While Thailand’s floods have been the ones that have continued to make international headlines, the rest of Southeast Asia has not been spared by some of the worst floods to hit the region for decades. Relief agencies estimate that more than 9.5 million people — including more than 2 million in the Philippines and 1.6 million in Cambodia — are currently affected by the floods. Since June, when monsoons first started to rain down on the region, more than 20 million across Southeast Asia have been affected. In Cambodia, where per capita GDP is just $830 compared with $4, 716 in Thailand, nearly 20% of this year’s rice harvest is said to be lost from floods that have gripped the country for over three months. Many international nongovernmental organizations are reporting they lack the funds to continue operations even though some 1.6 million people are still in need of assistance, with three-quarters of Cambodia’s land submerged for months, according to a U.N. Office for the Coordination of Humanitarian Affairs report. More than 240 flood-related deaths have been reported in Cambodia to date. (Reuters) - Insured losses from Thai floods could be in the double-digit billions of dollars and the disaster will lead to a re-assessment of weather risks to industries in Asia, a senior official from global insurer Allianz said. Calculating the true cost of the floods could take years in terms of working out the lost business to Thailand from investors who might now choose to invest in other countries, said Lutz Fullgraf, Allianz's regional CEO for global corporate and specialty. He said the losses comprise compensation to building owners in Thailand as well as manufacturers around the world who have suffered disruptions from the closure of Thai factories, and estimated they could turn out to be the world's biggest from flooding in a decade. "This for Thailand is definitely the costliest event, in terms of the insured values, even if you take into consideration the tsunami of 2004 and last year's riots. The loss here is much bigger," said Fullgraf. He pointed to an estimate by Thailand's insurance commissioner of more than $30 billion, although it was too early to verify the figure. "People did not have that (wealth and asset) accumulation expectation for risks in Thailand. Even if it is $20 billion, I think it will top the list of insured flood losses over the past 10 years," he said in an interview in Singapore. The disaster would lead the insurance industry to re-evaluate weather and other natural disaster risks to Asia's rapidly expanding industrial zones, many of which are in areas vulnerable to earthquakes, storms and flooding, Fullgraf said. "There definitely will be (a rethink). Either through specialized companies that provide these modeling tools or insurance and re-insurance companies will assess their overall (risk) accumulation in these areas," he said. Standard & Poor's in a report earlier this month said Thailand's non-life insurers may collect gross premiums of about $4.7 billion this year, which meant the global insurance industry would take years to recoup losses from the floods. "Clearly if you look at the Asia-Pacific region alone, there will not be very many happy faces in the insurance industry this year," Fullgraf said, adding it was too early to say whether the Thai floods would affect insurance premiums globally. Allianz, Europe's biggest insurer, said floods in China in May 2010 caused $18 billion in economic losses, topping a list of the world's costliest floods between 2001 and 2010. Floods in Australia last December ranked number 6 at $5.1 billion. Flooding in Thailand has claimed 562 lives since late July and swamped about 900 factories in seven industrial estates north of the capital, disrupting supply chains of many international companies, including Toyota Motor Corp, Sony Corp and Lenovo Group Ltd. The disaster could shave 2.5-3 percentage points off the country's GDP growth, Thailand's deputy prime minister has said. Globally, PC shipments could be crimped by as much as a fifth in the first three months of 2012, hurt by the shortage of hard disk drives, said technology research firm IDC. Before the floods, Thailand accounted for 40-45 percent of global hard disk production. Fullgraf said the floods were a wake-up call, exposing the frailty of global supply chains for autos, electronics and even household goods like mouthwash. "A loss like this always has knock-on effects because there are no shock absorbers any more," he said, as more major disruptions are likely from increasingly bad weather. "The climate is changing and the question is really are we prepared for it, especially in Asia where there are a lot of developments at or close to the sea and low-lying areas. 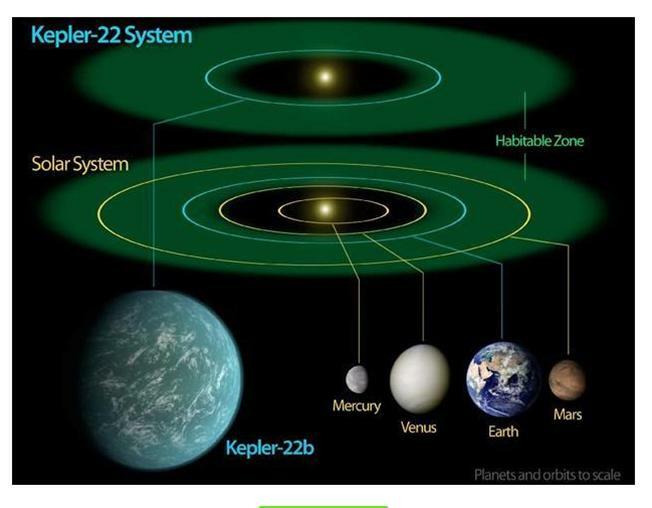 The impact will be significant," he said. Scientists say a warmer world will trigger more intense rainfall, stronger storms and rising sea levels. Fullgraf said this means factory managers and board members of large manufacturers need to take a harder look at reducing the risks from wilder weather. This could be as simple as building on higher ground or building factories with raised manufacturing floors. "We will certainly pay a little bit more attention than we have in the past to flood risks in Thailand," he said. "It will have some impact on how we approach underwriting in general." He said Thailand had been, in most cases, regarded as a non-natural catastrophe area, so the scale of the floods and the knock-on impact on global supply chains were a surprise. Reinsurer Munich Re also said the floods were Thailand's worst natural calamity and part of a global pattern in which weather-related catastrophes have more than tripled in the past 30 years. Last week, Munich Re said a series of natural disasters in the Asia-Pacific, including the quake and tsunami in Japan and floods and a major cyclone in Australia, had caused $259 billion in economic losses for the first nine months of 2011. That is 80 percent of all losses globally. 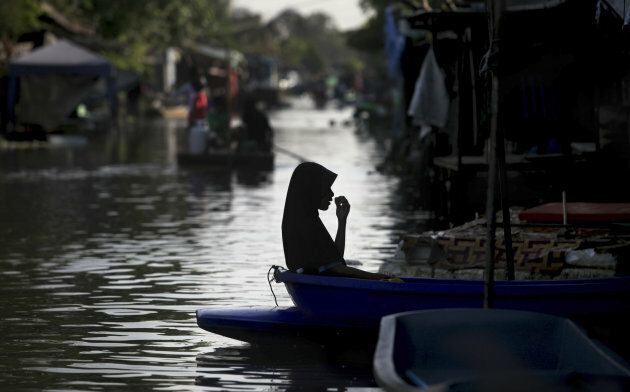 A Thai Muslim girl is silhouetted against floodwaters as she rides a boat on the outskirts of Bangkok, Thailand, Friday, Nov. 18, 2011. A Thai security guard sits next to license plates lost in flooding and displayed on a stairway of Bang Pai hospital at Bang Khae district in Bangkok, Thailand, Friday, Nov. 18, 2011. City Hall is stepping in to clarify details of the government's scheme to provide financial help to flood victims, after confusion arose about how it will work. On Nov 8, the cabinet approved a proposal to grant 5,000 baht in financial help to each flood-affected household. But questions have arisen as to why only the legal owners of flooded houses are entitled to receive the aid, and what documents should be submitted along with their application for assistance. The government says 621,355 households in the capital have been hit by the floods. The cabinet has decided to set aside about 3.1 billion baht to help them. Bangkok Governor Sukhumbhand Paribatra said he had told all 50 district offices to start registering flood victims under the programme. Two types of flood-affected households were defined as: those flooded as a result of a sudden incident that damaged a house; and prolonged flooding of at least seven days which damaged property. In both cases, the houses or properties must be located in areas declared flood-affected zones, said the governor. The legal house owner is required to submit a copy of his or her house registration document and ID card with authorities. Tenants are required to submit a copy of their rental contracts and ID cards. Flood victims should visit à¸‚à¹ˆà¸²à¸§à¸¥à¹ˆà¸²à¸ªà¸¸à¸” (à¸ˆà¸²à¸..à¸à¸£à¸¸à¸‡à¹€à¸—à¸žà¸¡à¸«à¸²à¸™à¸„à¸ £) or call 1555. A total of 32 districts of Bangkok are regarded as flood zones: Bang Kae, Bang Khen, Bang Kholaem, Bang Phlat, Bang Sue, Bangkok Noi, Bangkok Yai, Chatuchak, Din Daeng, Don Muang, Dusit, Kannayao, Klong Sam Wa, Klong San, Klong Toey, Laksi, Lat Krabang, Lat Phrao, Min Buri, Nong Chok, Nong Khaem, Phasicharoen, Phra Nakhon, Rat Burana, Sai Mai, Samphanthawong, Sathon, Taling Chan, Thawi Watthana, Thon Buri, Wang Thonglang and Yannawa. MR Sukhumbhand said he had told district staff to try their best to ensure convenience for applicants. If flood victims did not have their registration documents with them, staff should check the house registration database for them. As for unregistered residential buildings, their owners could call on witnesses to establish their ownership rather than relying on house registration documents, said MR Sukhumbhand. "Flood victims should be able to receive payments from Dec 20 onwards, and City Hall will not impose a deadline of relief applications as we realise that flooding situations are different across the city," said the governor. The Bangkok Metropolitan Administration is also drafting legislation to allow additional assistance of 1,500 baht per household for flood victims in Bangkok, he said. Service points could be opened in flooded areas to help with registration. The first applications for flood relief aid could be sent to the government by tomorrow, said Bangkok city clerk Charoenrat Chutikarn. Pictures of flooded houses were not required to be submitted along with applications for financial assistance, but the application form must be signed by credible witnesses, he said. After verifying the applications, the BMA would forward them to the Department of Disaster Prevention and Mitigation for final approval before the Government Savings Bank handles the payments, he said. The process should take no longer than 45 days from the day applications are received, said Mr Charoenrat. Sanyan Chantharat, an adviser to the Bangkok governor, said although flood victims are not required to submit pictures of their flooded houses, such images would make it easier for officials to verify applications. "For unregistered houses, owners can submit water and electricity bills as evidence [of ownership]," he said. Piboon Wekhawakayanon, who is chief of the Nong Khaem district office, said staff there had so far received more than 2,000 applications from property owners and also tenants for financial assistance. Applications for relief can be submitted from 8am to 4pm every day, Mr Piboon added. The Flood Relief Operations Command and City Hall will hold talks with residents from Pathum Thani's Lam Luk Ka district today to solve a dispute over the Khlong Hok Wa flood barrier. The three-way talks follow the demolition of a 70-metre section of the sandbag wall by angry Lam Luk Ka residents on Thursday in a bid to drain floodwater from their area. The breach caused floodwater to surge into areas in Bangkok's Sai Mai district. The incident later turned violent when a small bomb was thrown at a group of Sai Mai residents while they were fixing the damaged sandbag barrier. Deputy city clerk Sompob Rangabtook will represent the Bangkok Metropolitan Administration in the talks with the Lam Luk Ka residents, which is scheduled for around midday at the Big C superstore near Khlong 4 canal today. Mr Sompob said the BMA has asked the Lam Luk Ka residents to send six representatives to the talks. To prevent a possible confrontation, other residents from Lam Luk Ka and those from Sai Mai were urged to stay away from where the talks are taking place. The deputy city clerk said Lam Luk Ka residents had demanded the authorities lower the height of the 6km sandbag barrier to allow more water to flow from Lam Luk Ka towards Bangkok. "As far as we know, the residents want to see the water levels in both Pathum Thani and Bangkok not exceed more than 40cm," Mr Sompob said. Lam Luk Ka residents also demanded that the Phraya Suren sluice gate be opened wider to speed up water flow from Pathum Thani into Saen Saeb canal. Mr Sompob said the BMA had already complied with that demand by widening the sluice gate from 40cm to 1 metre. Water levels in Khlong Saen Saeb and at the Bang Chan intersection were quite high yesterday probably due to the widening of the sluice gate. Froc deputy spokesman Pol Gen Pongsapat Pongcharoen yesterday said police were investigating Thursday's explosion at Khlong Hok Wa. Pol Gen Pongsapat said witnesses told the police that they saw a man, believed to be a Sai Mai resident, on a motorcycle ride onto the bridge and throw an object into the crowd which resulted in a small explosion. Police hope to identify the man soon, he said. He said police would summon four people injured in the blast for further questioning and were urging anyone with information to contact police at Sai Mai Police Station. He said 200 police officers from the Border Patrol Police and Metropolitan Police Division One were sent to the scene to control the situation and to prevent further violence. Meanwhile, in Bangkok's Min Buri district, Wassana Phongpheng, a spokesperson for Samakkhi Khlong's Song Ton Nun residents, has warned people in her area are becoming increasingly angry at a lack of assistance from authorities. She said her community is where floodwater from Khlong Sam Wa and Khlong Saen Saeb meets before flowing in Khlong Prawet. She said around 270 households have had to put up with high floodwater for more than a month. Authorities need to pay more attention to the plight of people in this area, Ms Wassana said. Residents will have no option but to take action to make their voices heard if authorities ignore them, she warned. Nonthaburi residents want City Hall to open the Khlong Maha Sawat sluice gates to allow floodwater to flow out of their areas although it may raise flood levels in Bangkok's Bang Phlat district. About 1,000 people organised through Facebook gathered at the Nonthaburi provincial hall yesterday to submit their demand through Nonthaburi governor Wichien Puthiwinyu. They met for talks to find solutions to the month-long flooding in Bang Bua Thong, Bang Kruai, Bang Yai and Pak Kret districts. The Khlong Maha Sawat sluice gates are located between tambon Plai Bang municipality in Bang Kruai and Bangkok. The gates are overseen by the Bangkok Metropolitan Administration (BMA) and remain closed as part of flood prevention measures for the capital. The residents believe opening of the gates would ease flooding in Nonthaburi as floodwater could make its way out to Khlong Maha Sawat and canals in Bangkok. In their view, this is another way to drain the water out of the province. Although there are fears opening the gates may affect Bang Phlat district in Bangkok where water began to recede last week, Mr Wichien promised he would send a request to the Bangkok governor via the Flood Relief Operations Command (Froc). He told the residents they would get an answer by 1pm tomorrow. Phue Thai MP for Nonthaburi Chalong Riewraeng, who was present during the talks, said if Bangkok does nothing, "we have to do it our own way". Mr Wichien and Mr Chalong also promised to obtain 1,000 water pumps to speed up water drainage in Nonthaburi. They aim to reduce the water level by more than 20cm. If the drainage goes as planned, residents, especially those in Bang Bua Thong, could return home by Dec 1. However, those in Sai Noi district may need to wait longer because the area has been severely hit by floods. Meanwhile, Agriculture and Cooperatives Minister Theera Wongsamut, who inspected the western side of the Chao Phraya River in Nonthaburi and Pathum Thani yesterday, assured flood victims their situation would improve as officials continue to repair damaged levees and use more pumps to drain water. The Royal Irrigation Department has given 50 water pumps to the two provinces to ease their flooding. Angry residents in Bangkok's Bang Khunthian district yesterday agreed to end a road blockade after reaching a deal with City Hall to drain rising floodwater that has ravaged their communities. Bang Khunthian district office chief Pongsak Phansawas said residents living in the National Housing Authority's (NHA) six projects in Thon Buri agreed to cooperate with the Bangkok Metropolitan Administration (BMA) to jointly manage the flooding. Under the accord, Khlong Lad Lamphu on Rama II Road will be closed to prevent more water from entering the NHA's Project 1, known as Keha Thon Buri 1 community, on Soi 69. Residents and the BMA will later jointly drain floodwater out of the estate to Khlong Rangkaeo, where it will flow into Khlong Si Baht and Khlong Ratchamontri before entering the Gulf of Thailand in Bang Khunthian district. Mr Pongsak said flooding in areas along Rama II Road, particularly on Soi 69, will improve in the next two weeks as residents understood and agreed to cooperate with authorities. Over the past two days, the level of floodwater in Bang Khunthian has fallen by 15cm after City Hall installed four big pumps at Khlong Ratchamontri to drain water into the sea. However, officials and residents have been told to be on full alert for more floodwater coming from nearby Bang Bon district and Khlong Phasicharoen. The flooding has inundated 2% of Bang Khunthian's area. All sides must work out a plan on how to turn Khlong Lad Lamphu and Khlong Rang Kaeo into water drainage canals, he said. Construction work had resulted in the two canals becoming dead-ends. Meanwhile, Highway 340 has been drained of floods so it can serve as an alternate route for the South if needed, Transport Minister Sukumpol Suwanatat said yesterday. The ministry has cleared the highway's Bang Bua Thong-Suphan Buri route to provide a detour to the South in the event that Rama II Road is impassable. However, ACM Sukumpol said travel along the drained section was not yet advisable as many cars were still parked there, leaving only one lane free on some sections of the highway. He advised motorists travelling to the South take Rama II Road, which is still passable, instead of Highway 340. In other news, Uthen Chartpinyo, adviser to a water management committee chaired by Prime Minister Yingluck Shinawatra, has urged the government to consider his proposal to speed up draining in western Bangkok. He suggested the cleaning and dredging of Khlong Sukot, Khlong Sam Baht, and Khlong Bang Toey should be carried out as soon as possible as these canals are shortcuts from Khlong Maha Sawat to the Tha Chin River. He also said the sluice gates need to be opened wider. In addition, he suggested the Royal Irrigation Department, Highways Department and BMA meet to divide responsibility in the dredging of canals and installing extra pumps. Thai mother and her son sit on a homemade boat at a flooded area at Bang Khae district in Bangkok, Thailand, Friday, Nov. 18, 2011. 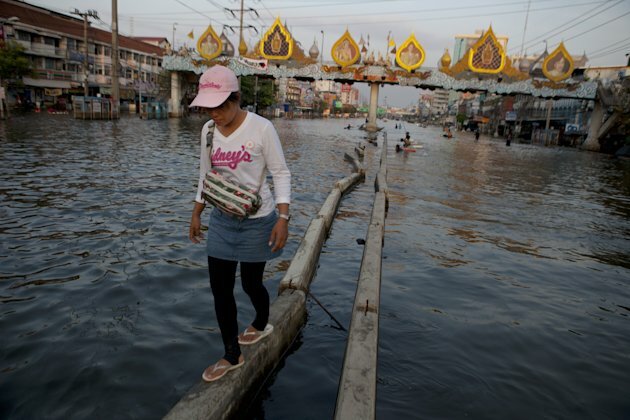 A woman walks along the only dry area along a flooded street in the district of Rangsit November 18, 2011 in Bangkok, Thailand. 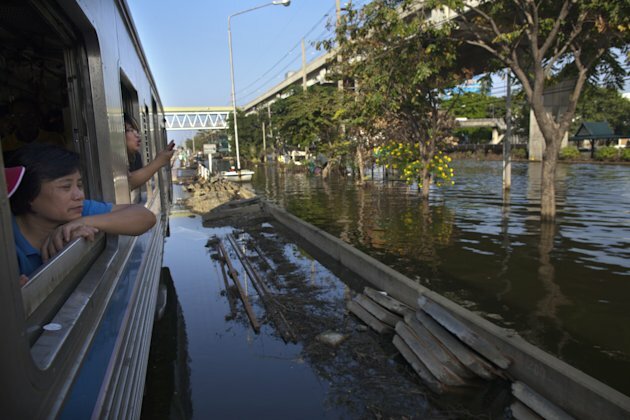 BANGKOK,THAILAND - NOVEMBER 18 : A woman looks out from the window of a train riding through a flood zone bound for Bangkok from the Don Muang area November 18, 2011 in Bangkok, Thailand. 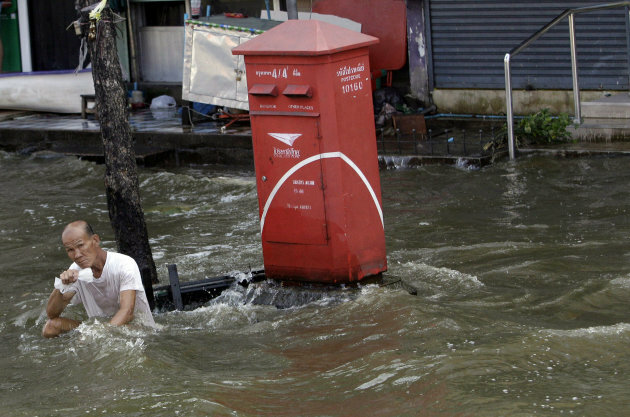 A resident sits next to a post box in floodwaters at Bang Khae district in Bangkok, Thailand, Friday, Nov. 18, 2011. Phatum Thani, a policeman stands on a barrier at Khlong Hok Wa in Bangkok, Thailand, Friday, Nov. 18, 2011. 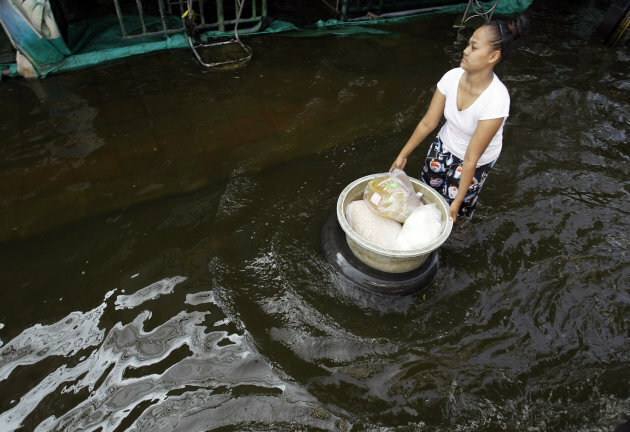 TOKYO: Thailand's worst floods in decades may gradually be subsiding but ripples will be felt by companies and consumers for months to come, analysts say, underlining the fragility of the global supply chain. Severe flooding since October, which has left hundreds of people dead, has also hurt a wide range of industries in the production hub, particularly the automotive and computer hard-disk drive (HDD) sectors. The consequences have been global, hitting companies such as personal computer maker Dell, HDD makers Toshiba and Western Digital, and auto giants Toyota and Ford. As with supply chain woes after Japan's March earthquake, analysts say the Thai disaster raises questions as to how well companies understand their supply networks for essential parts, and whether risks could be better managed. However, "companies are limited in what they can do because possessing extra inventory pressures corporate earnings and can heighten risk," said Masaki Nakamura, analyst at MM Research Institute in Tokyo. In particular, the "just-in-time" delivery system pioneered in Japan and often used in the technology and car sectors to deliver components and raw materials only when needed is vulnerable to such shocks. "While the basic concept behind 'just-in-time' will remain unchanged, firms will now further reduce production risks" by establishing facilities elsewhere after the floods, said Toru Nishihama, senior economist at Dai-Ichi Life Research Institute. Thai factories supply about 40 percent of the world HDD market and while analysts do not see much of an impact on PC sales in the Christmas holiday shopping season, conditions will remain tight into 2012. "During the Christmas season, consumers may not see too much in terms of price increases for PCs" because components for those goods were pre-ordered in the previous quarter, IHS iSuppli analyst Fang Zhang told AFP. "However, if they need to purchase external HDDs, they will see a big price increase." In Tokyo's Akihabara electronics district, signs can be seen in shops selling HDDs calling on buyers to purchase now to beat price hikes. Others have stopped selling altogether. "We can't buy HDD stocks as prices are four- to five-times higher than normal," said Yu Sugawara, a buyer at Hamada Electrical Equipment Manufacturer. "Customers won't buy at higher prices, so we can't pass on higher costs through retail prices. We've stopped selling hard disks rather than squeezing our business." The flooding has made a bad year worse for Japanese firms that were already fighting to restore output after the March earthquake and tsunami, and as they grapple with a profit-eroding strong yen. By late October more than 400 Japanese companies suspended operations or lowered output due to the Thai floods that claimed more than 560 lives and damaged millions of homes and livelihoods. Japan is Thailand's biggest foreign investor. Its industrial zones and quality infrastructure have attracted Japanese firms looking to escape higher corporate tax and labour costs. Nevertheless, Indonesia, Vietnam, and India look set to receive more investment from Japanese firms than Thailand next year as companies look to ease production concentration risks, Dai-Ichi's Nishihama said. In September Toyota said global motor vehicle production had recovered to normal after it hired thousands of temporary workers to make up for lost output following the March quake. But it was forced to halt its three assembly plants in Thailand in early October due to the flooding and will not reopen them until November 21. Toyota and Honda withdrew their annual earnings forecasts as they assess the damage. Automakers Nissan and Mitsubishi Motors and electrical firms Pioneer, Sony, Canon and Nikon were also forced to adjust global production due to the Thai plant shutdowns and supply woes. Some companies in the flooded Ayutthaya industrial zone about 80 kilometres (50 miles) upriver of Bangkok have at least been able to send in divers to retrieve hardware containing crucial data as waters there gradually recede. While limited production has restarted at some facilities away from the floods, analysts warn the effects of the disaster may last longer than Japan's earthquake and tsunami. "Japanese companies could start restoration about two months after the tsunami," said Nishihama. "But with facilities still flooded in Thailand, it is harder to predict when production can return to normal." The development of the Chao Phraya River basin needs a rethink now the floods have passed their crisis point, said Thai Rath newspaper. The flood has shaken the public's confidence in the government's management due to corruption, unequal access to help, turf disputes and inefficiency in managing the water flow. It is true the flood was caused partly by unusually heavy rainfall this year, but some academics believe that more effective and efficient water management could have prevented much of the loss to life and property. Workers at a rice factory in Samut Prakan province. Rice exports are expected to hold their own this year despite the damage caused by the floods, and a forecast drop in production caused by the government’s price pledging scheme. Floods have occurred almost every year in all four regions of Thailand - the North, Central Plains, Northeast and South - but truly disastrous floods that affected Bangkok occurred previously only in 1942, 1983 and 1995. The first two affected inner Bangkok more than the 1995 flood, which hit the city's outskirts harder. In 1999, Prof Dr Thanawat Chaluphongsakul and a team of researchers from Chulalongkorn University published a study which analysed the river basin's topology and natural waterflow. It also pointed out the reasons for the floods. The 1942 flood which inundated inner Bangkok was caused purely by nature as no dam or other man-made construction was in place at the time to slow the waterflow. Nor was any flood prevention system in place in those days. The 1983 flood was caused by heavy rains in the upper Chao Phraya River basin, which caused widespread floods in inner Bangkok. It prompted authorities to build walls along both sides of the Chao Phraya River. The 1995 flood was caused by heavy rains in the Nan and Pasak rivers which overflowed their banks in Chai Nat, Sing Buri, Ang Thong, Ayutthaya and Bangkok. Bangkok suffered less than other provinces further up the Chao Phraya River. Dr Thanawat said people settling in low-lying areas prone to flooding or flood-risk areas along rivers and canals were hit hardest. The vast irrigation system in the Chao Phraya River basin and various sluice gates and flood barriers, rather than unusually heavy rainfall, also contributed. "Constructing sluice gates and flood barriers may cause social friction between farmers and those living in cities," he said on a prescient note. Channelling the floodwaters down a natural pathway would help dispel them more than relying on dams and flood barriers, he said. Thai Rath said it is a shame that politicians have not taken up the report's findings. Had the paper's advice been heeded, the damage caused by successive floods to industries, agriculture and communities could have been prevented. Even though the Yingluck Shinawatra government is drawing up long-term plans for flood management, they will take some time to implement as management of the lower Chao Phraya River basin will have to be overhauled, it said. A reminder, Bkk gov says volunteers are welcomed to join Big Cleaning Day in Bangplad, meet in front of Lotus at 10AM on Sunday. Bkk gov leads public in cleaning up Lad Prao 5-way junction after flood water has receded. Prime Minister Yingluck Shinawatra said on Saturday that the government’s flood war room had confirmed that areas in inner Bangkok will not be flooded. In her “Yingluck government meets people” weekly talk show on radio stations of the Public Relations Department broadcast from Indonesia this morning, Ms Yinluck said officials can hold mass volume of runoff from the North at Khlong Bang Sue. This can prevent inner areas of Victory Monument, Pathumwan and Silom from floods, she added. The floodwater inundating the districts of Bang Phlad, Bangkok Noi, Bang Khae, Bang Kruai and Nakhon Chaisi has been gradually receding. The Royal Irrigation Department reported that about 63 million cubic metre of water has been draining out from the areas per day, she said. On the conflict between flood victims in Khlong Hok Wa and Khlong Mahasawat and state authorities, the problems had been settled by the Flood Relief Operations Command, said Ms Yingluck. The prime minister insisted that after the water recedes, the government will rapidly reconstruct flooded provinces and rehabilitate flood affected people and manufacturers. 2012-Survival-Guide Hock or Truth ?